This dish can also cozy up alongside fried chicken. 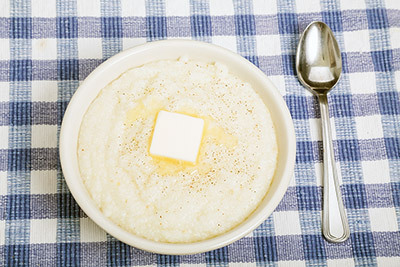 In a 4 quart pan, bring the chicken broth (or stock) to a boil and add grits. Simmer for 2 minutes and add the cream. Continue to simmer until grits are done, about 20 minutes. Remove from heat, add butter and salt to taste. Serve for breakfast with butter and brown sugar or maple syrup.